The Full Moon is Friday December 25. Mercury is low in the evening sky. Jupiter, Venus and Mars form a line in the morning sky and are joined by Saturn. Mars is close to the bright star Spica on the 25th. Venus comes closer to Saturn. 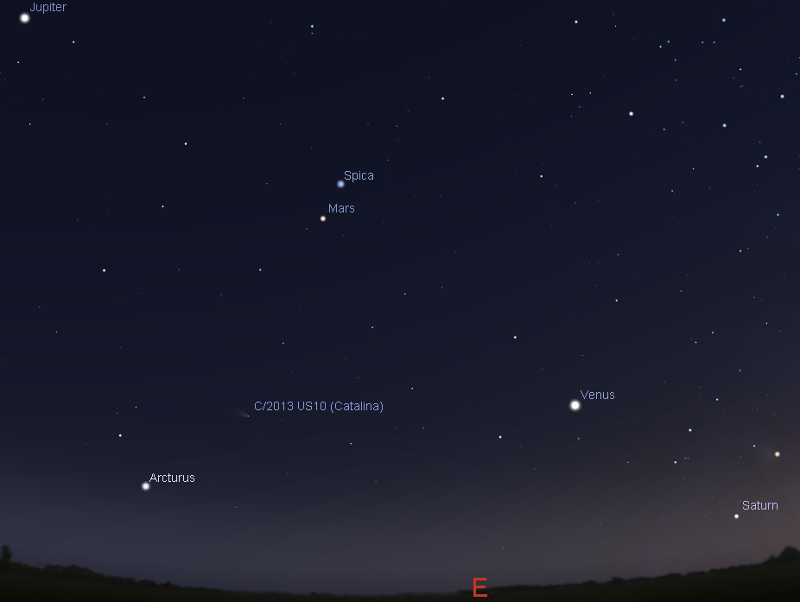 Comet C/2013 US10 Catalina is higher in the morning sky. The Full Moon is Friday December 25. This is the first full Moon to fall on Christmas Day since 1977. Evening sky on Saturday December 26 looking east as seen from Adelaide at 21:15 ACDST. 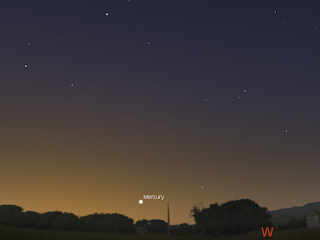 Mercury is just above the horizon in the late twilight. Similar views will be seen elsewhere in Australia at the equivalent local time. (click to embiggen). Mercury starts to fall back into the twilight. 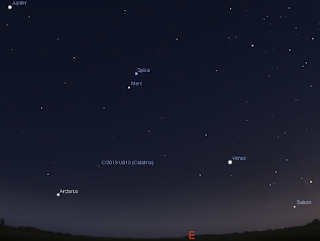 Early morning sky on Friday December 25 looking east as seen from Adelaide at 5:00 ACDST showing Jupiter, Mars, Venus, Saturn and comet C/2013 US10. Similar views will be seen elsewhere in Australia at the equivalent local time. (click to embiggen). Saturn returns to the morning sky. You will need a clear, level horizon to see it effectively at the beginning of the week. 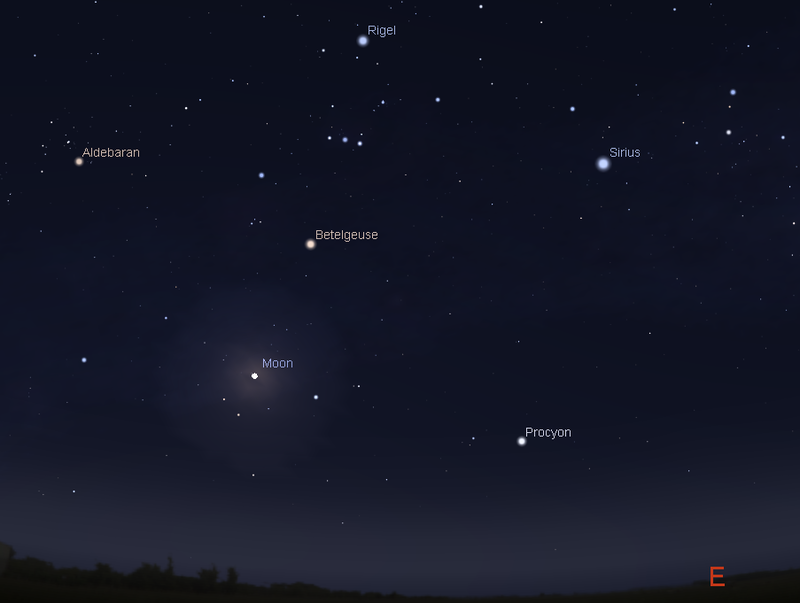 Jupiter, Mars, Venus, Saturn and the bright stars Regulus and Spica form a line in the sky this week. Mars starts the week close to the bright star Spica, and while it is closest on the morning of the 24th, on the morning on the 25th it is less than 10 arc seconds further away, and will still look close. During the week Venus heads towards the head of the Scorpion, and Saturn. 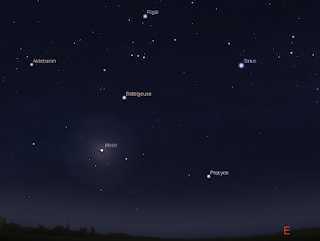 By the end of the week Venus, Saturn and the red star Antares form a triangle low in the early twilight. The Christmas Moon rises on the 25th under the constellation of Orion, with Taurus, the Pleiades and Canis Major nearby. This shows the north-eastern horizon at around 10:00 pm local daylight saving time. (click to embiggen). If beautiful Christmas morning planets are not enough, Christmas evening is rather special. The rising full moon is the first Christmas Full Moon since 1977, a gap of 38 years. The next will not be until 2034, 19 years later.